Nocart Oy has signed a supply contract for the delivery of a 30-40 MW solar hybrid power plant to Zambia. The contract is for the first part of a 100MW solar hybrid power plant to supply power to a sugarcane plantation in Zambia’s Shang’ombo district. The total value of the sugar plantation investment is 2.7BUSD and the value of the signed contract for Nocart is 200MUSD. 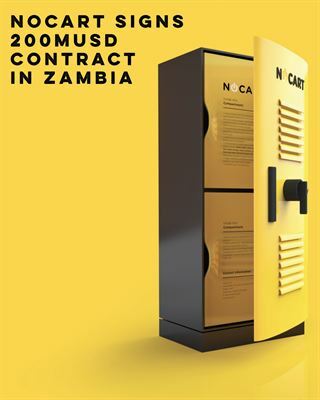 A few weeks ago, Nocart announced a Memorandum of Agreement with this customer, selecting Nocart as the technology supplier of complete power plants to Zambia for their upcoming projects. This supply contract covers the first of potentially several upcoming projects included in that Memorandum of Agreement. The project will be delivered during two years from the kick off. This supply contract and delivery consists of a 30-40 MW solar diesel hybrid power plant and is the first part of a 100MW solar hybrid power plant. The Nocart power plant will supply power to, among other things, a 30,000 hectare sugarcane plantation and a modern sugar processing factory which is expected to crush approximately 6,000,000 tonnes of sugar cane per year, producing about 800,000 metric tonnes of sugar. In December 2016 Nocart received a 5MEUR equity investment from Cleantech Invest SPV 5 AB and co-investors. The effective fully diluted ownership of Cleantech Invest in Nocart is 19.3%. Cleantech Invest and its affiliated companies own a total of 21,4% of Nocart.